Thank you for your interest in Ikebana. 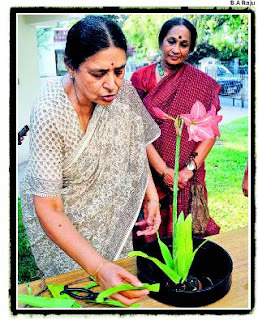 You can learn Ikebana from our Teacher Sensei Malathi Pandurang who teaches in Beasant Nagar of Chennai. If you are interested to have more details, please call me to +91-9791251842. Will give details then. very nice article!I do like it. I just came back from Japan,I also went to visit my teacher Ishikawa Sensei,and enjoy once more her beautiful Ikebana.I bought new Basami(Ikebana scissor)and wire etc. It will be nice to go to Japan together......Next week I will go to Italy. That is a wonderful article.I hope you all get a chance to go to Japan(it is a wish for myself also) and study at the Sogetsu Headquarters. Lucky you Valeria, and have a happy holiday in Italy! Yes Keith, we do so want to go as a group to Sogetsu, lets hope we manage to do that! Thanks Venkatesh...got your sms'es....a reply on its way!